Cross Ocean is a sales driven network whose aim is promoting interaction and successful sales results between members on a global scale. EUR 1,250 per year to be paid once a year and which is non-refundable. Payment is due 30 days after receipt of invoice. Conference and network gathering frequency: once per year. A maximum of 4 participants from any one company can attend. Communication must be efficient and speedy at all times. A clear NO is required instead of stalling or failing to reply. Non-timely communication and non-timely following up of sales leads received from the network may result in exclusion from the network. Sales leads given to alternate members in the case of no response. Investigation by Cross Ocean if a minimum of 2 members complain independently of each other about lack of communication. This may result in exclusion from the network. Any email MUST be replied to within 48 hours EVEN if containing little or no update. Sales leads are provided on a regular basis by Cross Ocean to the members. Sales leads are derived from the internet, attending trade shows, intel from various sources etc. and may/may not be current, however it is the duty of the member to follow up and to give feedback to another member counterpart if more members have received the lead. Sales leads given to e.g. members in Switzerland and the Philippines must also be followed up by the same and must NOT be given to any company’s own office in the origin or destination countries. Sales leads may be freely used if there is no active response from any member or no interest, as the case may be. Cross Ocean also reserve the right to forward leads to others in the cases of consistent inaction, no-showing and/or lack of communication. Members of Cross Ocean Network have a duty to inform the management if they have payments unreasonably overdue from any Cross Ocean member. Payments that are overdue by 60 days or more will automatically result in in a notice on our website as well as a notice in our newsletter. We ask members to inform us TIMELY. Cross Ocean does NOT have a payment insurance scheme. We have determined that members generally have their own insurance and instead we have kept the membership fees at the same level since our beginning in 2012. Cross Ocean is a network only and does NOT take any responsibility for business entered into between members. 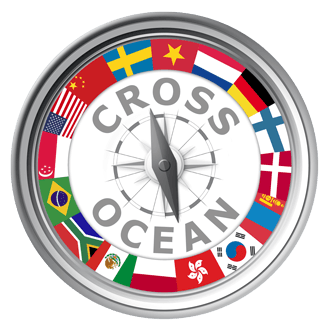 Cross Ocean will assist to push members to pay freights and charges due and will, after due deliberation, exclude any member found to be in breach of common standards with regards to payment, codes of conduct and proper ethics in business. Cross Ocean will publish in its own newsletter, as well as in www.projectcargo-weekly.com, a list of delinquent payers or companies that have been found to be dishonest in their dealings. Cross Ocean will also announce the companies on www.freightdeadbeats.comCross Ocean does its best to choose reliable and recommended members, but things can change rapidly in this business and companies that were once considered creditworthy and trustworthy can for whatever reason change overnight. In this eventuality, Cross Ocean does not take any responsibility for the due diligence and the duty of freight collection and business interaction is ALWAYS a matter between the members themselves. We cannot be a judge and jury but we will do our best to support, push and name and shame defaulters and irresponsible members, as well as exclude them without delay. A minimum of 2 independent members have complained about unreasonable payment delays. The membership fee for inclusion in the network has not been paid. The communication rules are not adhered to. Conduct at conferences is inappropriate or ‘uncalled for’. By joining Cross Ocean members agree to abide by these guidelines.